Panel Built modular office buildings provide a safe, clean and quiet industrial or professional environment. Ideal for warehouse office applications or any commercial setting. These durable and attractive prefabricated structures are ideal for many modular and industrial building applications. Our exterior prefabricated buildings are the fastest way to add space. Our Pre-Assembled Buildings and Guard Houses are crane or forkliftable for easy and immediate placement. Ask about our in stock models. We can ship fast! Maximize space with a two-or three story modular inplant office. Access upper levels with a custom powdercoated stair system. 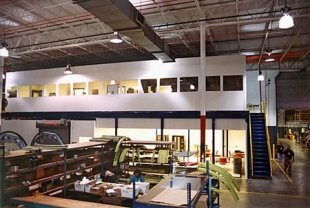 We can custom design your Modular Office, Mezzanine or Prefabricated Structure to suit your unique application. Available in a variety of panel finishes, PBI can flexibly meet your requirements for acoustics, R-factors, chemical resistance and aesthetics. Our pre-coated aluminum panels are resistant to abrasion and easily cleaned. For low maintenance, our vinyl covered gypsum panels are available with powder-coated binder posts for seamless appearance. Panel Built pre-assembled building systems are especially suited for industrial, commercial or military space management concerns that require an immediate building solution. Pre-assembled at our factory, these interior or exterior systems are shipped direct to your site, completely assembled and ready to go to work for you. A modular shipping office provides a fast, reliable and secure way for all your off-site office needs. You may be willing to set up your office at a construction site or in a warehouse to give your workers a safe place to work in. Panel Built now offers custom-built and swiftly delivered offices right where you want them. 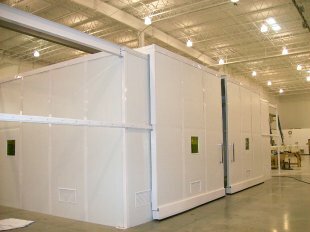 Every cleanroom is unique so Panel Built offers a variety of wall systems and air systems to meet your desired specifications. Panel Built offers up to a Class 1,000 clean room, and as always, our highly qualified staff is readily available to assist you in every step of your purchase, from design to installation. Pre-assembled building systems are especially suited for industrial, commercial or military space management concerns that require an immediate building solution. Pre-assembled at our factory, these interior or exterior systems are shipped direct to your site, completely assembled and ready to go to work for you. PBI has a variety of pre-assembled interior and exterior buildings. These fork or crane-liftable buildings can be moved instantly with no disassembly required and easily transported by truck to your facility. Ready to plug-in for immediate use. 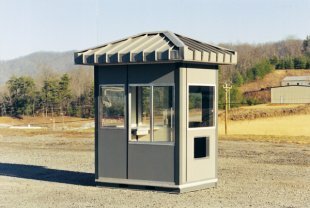 Machine or Equipment Enclosures, Material Storage Units, Consultant Space, Lookout/Observation Towers, Attendant Booths, Guard Houses and In-plant Offices. Our Modular Buildings Salt Lake City Utah systems will save you space. These Modular Buildings Salt Lake City Utah systems eliminate the need for , making the most use of your valuable space. NationWide Shelving has been selling Modular Buildings Salt Lake City Utah across the country and around the world since 1997. We have perfected the art of coordinating the order, the delivery and installation anywhere. Our highly trained designers will take the measurements of your space, and assure you get the most possible storage with your new Modular Buildings Salt Lake City Utah system. We have the know how, and product line to make sure you have the exact system to fit your needs. Before you commit to expensive lease space, give us a call. Many of our Modular Buildings Salt Lake City Utah systems will pay for themselves, just in lease savings alone! If you own well why not make the best use of your space? With decades of hands on design, installation, and manufacturing experience, no other company has the expertise to match that of NationWide Shelving. We have installed Modular Buildings in Salt Lake City Utah and all over the nation. We understand the challenges you face, and have designers ready to create innovative solutions. NationWide Shelving represents many Modular Buildings Salt Lake City Utah manufacturers so we can provide you the best value for your application and needs. Each manufacturer meets different specifications so we can find the right one for you. Pricing is by a project to project basis. But is is very easy to get a price. Just phone Chris Rodgers at 801-328-8788. systems.